NoLimitVPN needs a lot of improvement in the speed and coverage departments. The easy sign-up and assortment of payment methods, transparency and other positive aspects are simply not enough to make up for the poor quality of the service and support. There wasn’t much information listed about the company on NoLimitVPN’s web site. We would have loved to see an “about” page or at least a short description about them. After some more in-depth research, we found that they operate partially from France and partially from Singapore (it’s not mentioned which departments function from where exactly). Seeing how France has a history of s strict privacy legislature, and Singapore not being too far from the same situation, we can’t say that we’re exactly content about the countries they operate out of. NolimitVPN does provide a sturdy product, which even though lacks some features, is a rather complete package for the money. Did they compromise quality for price? Let’s find out. NolimitVPN has a rather poorly organized terms of service page that includes a lot of broad terms when it comes to restrictions. It’s hard to pin-point a set of activities that would lead to an account suspension, and we mention this because they have a strict no refund policy under any circumstances. According to a statement that NoLimitVPN made, they log peer to peer and SMTP traffic. Not only that, but they are not particularly torrent friendly. If they receive more than three DMCA complaints, they will close down your account. When signing up for their subscription, you must provide your full name and your e-mail address. However, using a generic name like John Doe doesn’t stop the registration process. NolimitVPN has an application for Windows that requires no installation. It can be ran directly through the executable downloaded from their website once the subscription has been activated (even if that subscription is the free trial). The application, even though is portable, and very basic, it offers basic security, as the connection established is through PPTP, as opposed to OpenVPN which should be the standard these days. There is a latency indicator next to each server location which should help you find the fastest servers available. We have to mention the fact the we had some issues with the France and UK servers where they either didn’t connect or they connected and disconnected shortly after (within 5-6 minutes). This happened quite a few times and it also reflected in the performance. We weren’t able to start any download while these issues were going on for example even though we were able to browse web pages and so on. Since the issues mentioned above kept on appearing, they created IP leaks and we weren’t able to get any conclusive speed test results for these two locations (mostly spikes and abnormal parameters during both browsing tests and torrent download). 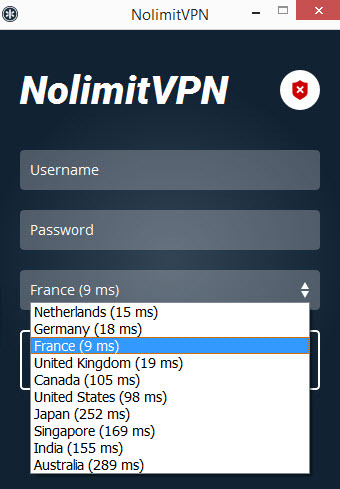 There is a huge lack of features and customization possibilities with NolimitVPN’s software. There is no option to change protocols, connection types, kill switch… anything really. The only thing you can change is the server location from a drop-down menu and that doesn’t even justify having a stand-alone application. There aren’t many features to speak of, none that can be customized at any rate, and this is mainly due to the lack of features mentioned above. Kill switch, auto-reconnect or other commonly encountered features are not available with NolimitVPN. It’s possible that the application itself is still under development, at least we hope it is, because otherwise it would be a real disappointment. We would also like to mention that they use Google’s DNS which is not something that we are huge fans of. We would like to talk about encryption though, since they only offered access via L2TP/IPsec and PPTP. In L2TP/IPsec, they use 256 bit AES and PPTP uses 128 bit encryption. One thing we would like to mention is that they use PSK for authentication in L2TP/IPsec, which is not really secure and most providers should try to steer away from PSK. As for PPTP, it is completely broken and shouldn’t be used by anyone for security and privacy purposes. OpenVPN is also available and it seems like it’s a recent feature. The tutorials on the website are a good clue of this fact, and the certificate was released on the 23rd of August, meaning that it’s about three months old. It uses AES 256-bit CBC and RSA 2048. Netflix and Hulu were not available on any of the tested servers at the time of the review. This is not something that we would consider a minus necessarily seeing how fewer and fewer VPN providers are able to have access to them, but we just think it’s worth mentioning. NolimitVPN offers an interesting feature called Streaming on demand, which basically downloads content on their end, then generates a link from the downloaded content, allowing you to view the content without actually downloading it to your computer or device. We tried it with a torrent documentary and it worked as advertised, starting the stream after less than a minute. There really should be more features available, and since they bothered to have a custom made application, we hope that there is some development going on. Of course, some server locations performed better than others based on location and other factors, but overall the performance was pretty bad and even though the speed wasn’t the highest around, the browsing experience is quite smooth with no issues or interruptions whatsoever. It’s worth noting that they are using cloud servers, which most likely has a negative impact on the speed performance and this is also a bad practice from security perspective. As you can see above, the download speed was less than 20Mbps on average. Having such a low speed can definitely be a deal breaker for some customers, so we hope that they work on their infrastructure which clearly needs a little attention. There isn’t much to say about the software itself since it’s an open-source solution, only that by using such a GUI, NolimitVPN doesn’t provide too many options to their customers. A stand-alone software would definitely be recommended. The price is fair, but the only difference between plans that we found is the bandwidth. You can find more information regarding the the three pricing plans here. NolimitVPN only accepts the following payment methods: Credit Cards, PayPal and Alipay. We would have loved to see more payment options, like crypto currencies. Their refund policy is that since there is a 7 day free trial for the full service, there are absolutely no refunds under any circumstances. In our opinion this really discourages clients to opt for a yearly subscription. Under no circumstances is a bit too drastic even for a service that offers 7 days of fully-featured free trial. The technical support experience was a bit shady, and it gave us the impression that the technicians don’t have much of a clue what they are doing, but rather copy/paste templates into poorly formulated e-mails. Our question was not of the highest difficulty, rather a clarification between the features of the different plans. The answer came quite a few hours later (although it was answered the same day) and it was basically just a template with some useful links in case we had more options. Upon continuing our conversation with them, we received the same rigid and unwelcoming response. On the plus side, the information was correct, but having to go back and forth to get a three word answer that sends you to the FAQ page seems to defeat the purpose of having a customer support team. NoLimitVPN offers online chat support but it seems that they are on the US Eastern schedule. The earliest we’ve seen them online was around 14:00 GMT. 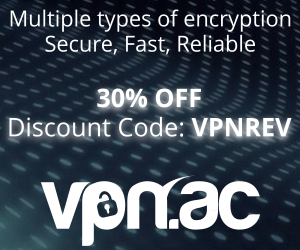 On their support page, they also mention that they have an IRC channel (#NolimitVPN) on FreeNode. Nice web site, easy to navigate and use. Streaming on demand feature is nice. No limit for simultaneous connections as long as the account isn’t shared with others. Good FAQ page and setup guides on their website. 7 days free trial for the fully-featured service. Strict no refund policy “under any circumstances”. Incomplete Windows application, even though it’s very simple to use, it lacks almost all useful features. Poor to average performance for the service. We don’t necessarily feel it’s a huge minus, but we would love to see improvement, especially since the service doesn’t really excel in any other department, so having better browsing and torrent speeds would really help them a lot. Poor mobile performance and no stand-alone mobile application available. Main supported protocols are PPTP and L2TP/IPsec. OpenVPN should be standard since years ago. Not enough payment methods accepted; no Bitcoin. 2048 bit encryption advertised on their web page, even though this is actually referring to the RSA not the AES cipher which is 256-bit. Cloud servers, not dedicated hardware, which means reduced security and speed. Due to the reasons mentioned above we give NolimitVPN a generous 4/10 with the hope that they will improve their service because it is promising. There are too many features missing and the performance is quite average at best, so we hope to see them in better shape in a future review.